Are you satisfied with the service you received while visiting a government office? If not, you don’t have to suffer in silence or take the law into your own hands. 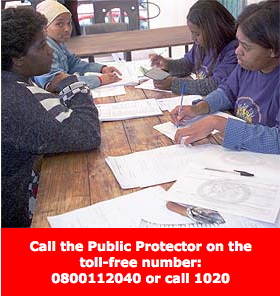 Whether it’s an identity document, birth certificate or pension grant application that is taking too long, you may lodge a complaint with the Public Protector. An example of someone who was helped by the Public Protector is Mr L Khumalo. He was released from a Limpopo Prison after spending 18 months in jail although he should have been released. Khumalo was only released after he approached the Public Protector. It was established that he unlawfully stayed in jail after a court clerk failed to do a warrant for his release. Khumalo’s case is an example of the 17 000 different complaints the Public Protector receives every year countrywide. The Public Protector was appointed by Parliament in line with the Constitution. He is not controlled by any political party but reports to Parliament. Lawrence Mushwana, the man in the position of Public Protector, is like a referee who looks at both sides of a problem. He examines all the relevant information and does everything he can to find a solution to the problem. The purpose of Mushwana’s office is to give South Africans the opportunity to report problems they have with national, provincial and local government departments. Any person employed by the state, like police and clerks, can be investigated. Companies and corporations partly funded by government like Eskom and Telkom are included. treatment, violation of human rights and abuse of state money. The Public Protector cannot investigate judgements made in courts. It also can’t probe private companies, doctors and lawyers. 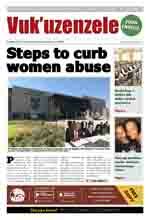 The Public Protector’s spokesperson, Charles Phahlane, said they resolve about 15 000 cases each year. He said there was a serious need to inform people about how the Public Protector’s office could help them, because many still didn’t know about it. But Phahlane advised people not to rush to the Public Protector’s office before first trying to resolve the problem with the relevant office. "Speak to the officials involved, the head of the department or the manager. It is only after your problem was not resolved that you can contact the Public Protector," Phahlane said. The services of the Public Protector are free and confidential.